Africa today is politically part of the centralized world order and is largely economically dependent on the export of raw materials, mainly to Europe, the USA and China. Internally, large parts of Africa are plagued by poverty and lack of financial inclusion¹. The record keeping structure is poor and digital identity is of the lowest in the world² which means that access to credit and liquidity is low. African entrepreneurs have one of the highest barriers to entry in the world³. Ironically, Africa is the most resource-rich continent in the world but experiences large capital outflows of most of the profit generated there⁴. It is set to contribute more than half of the global population growth by 2050⁵ which will add to the pressures of economic migration. In order to successfully overcome its present and future challenges, Africa will have to embrace the potential of digital technologies. Below is the future we envision for Africa. It’s 2021 in Nairobi Kenya. Akeyo just finished sending 100.000 Kenyan e-Shillings, a parallel cryptocurrency, from her crypto-wallet to her friend, Abla, that lives in Dodoma Tanzania. The transaction was performed on her new 100 $ Smartphone and was verified and completed in 3 seconds as it was executed through a blockchain system. Akeyo has chosen for a small percentage of each transaction to be sent to a separate wallet that will automatically buy her mobile phone insurance as soon as the wallet contains 10.000 Kenyan e-Shillings. With that amount now filled, Akeyo receives a notification from her insurance app that notifies her that her mobile phone insurance contract has been purchased and sent to her email address. Akeyo has a unique digital identity which she uses to vote, pay her taxes, view her pension fund savings information and for all her off-line and online mobile purchases. In developing nations, one of the biggest challenges for economic growth and prosperity is the lack of financial inclusion. The use of cryptocurrencies for payments and transactions can allow African nations to ‘leapfrog’ the absence of financial services infrastructures with increased transparency, security, and auditability. Mamadou, a coffee farmer that lives and works in the Congo Basin, just finished gathering his crop. He is selling 200 kilos of coffee in a digital peer to peer (P2P) marketplace and wants to be paid in Ether. After his sell order is filled, the ether is immediately transferred to his crypto wallet. Peer to peer digital marketplaces allow farmers to directly sell their harvest to buyers, bypassing middlemen and retaining full control of the profits of their crops. Mamadou is then prompted to send Yonas, his lender in the P2P microfinance platform Mamadou is using, 2% of the transaction value in order to pay back his loan. Blockchain-based parallel and crypto-currencies have completely liberalized the microlending industry as investors of all sizes and backgrounds can pool their resources. Blockchain-based microlending has eliminated all the intermediary parties that previously raised interest rates and now farmers like Mamadou have access to credit for as low as 1–2%. In 2018, Mamadou had paid for the same amount, 200% interest on his loan from a loan-shark. Microfinance has not succeeded in alleviating poverty and stimulating growth as interest rates range can between 20 and 80%⁶. Blockchain-based Microfinancing systems can provide immediate liquidity and access to credit for as low as 1–2%. All of the above are considered part of everyday life in 2021 Sub-Saharan Africa, where more than 500 million people have unique mobile phone subscriptions⁷. In addition, Community Governed Complementary Cryptocurrencies significantly increase liquidity, access to credit and the velocity of money in small communities, villages towns thereby stimulating regional economies and increasing GDP. The proliferation of digital technologies like blockchain and smart contracts systems contribute high percentages of national GDP and have led to a dramatic improvement in tax collection and the reduction of financial corruption. Due to the proliferation of high-velocity cryptocurrencies, endogenous growth has increased by 100%. The use of parallel crypto-currencies has allowed underdeveloped countries to ‘leapfrog’ the absence of financial services infrastructures such as bank branches and ΑΤΜs and achieve growth from within. Welcome to a decentralized future with digital identity, financial inclusion, and access to liquidity. All of this in a secure, traceable, corrupt-free technological and social environment devoid of parasitic middlemen. Berlin and Frankfurt (Germany), August 2018. Konfid.io is very pleased to announce our strategic partnership with the Frankfurt Based Venture Capital Firm, Greentec Capital Partners, headed by Mr Erick Yong. Konfid.io specializes in developing and using digital technologies to empower companies, entrepreneurs, and communities to achieve a profitable and sustainable economic future. 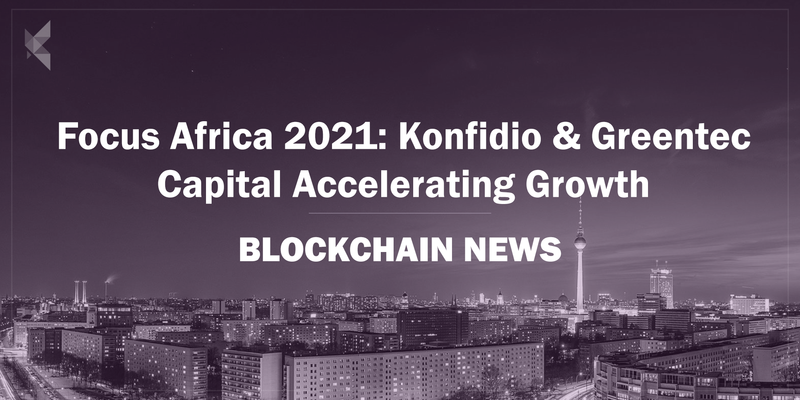 Greentec Capital Partners and Konfid.io share the same passion for Social Impact Investing and this was the main driver behind the formation of this partnership. GreenTec Capital Partners invests in African start-ups and SMEs with a focus on combining social and environmental impact with financial success. They use capacity building, process optimization and a diverse team of international experts to help companies implement and adapt the latest technologies to their models so they can extend their value chains and increase local impact. As a part of the partnership, Dr. Mervyn G. Maistry has joined the GreenTec Capital advisory board and will provide his expertise on disruptive technologies and decentralized applications to GreenTec. ⁶ What is the evidence of the impact of Microfinance on the well-being of poor people?